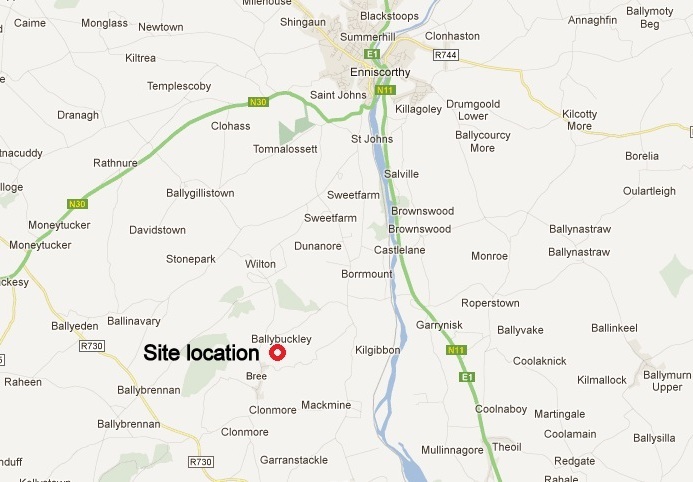 In 2007 the parish’s first archaeological investigation was carried out at Ballybuckley, Bree (see site location map at the bottom). It revealed evidence of medieval activity, possibly representing a farmstead, in the southern part of the townland, close to the Knockduff lane. This archaeological work was carried out in advance of a proposed quarry development (since stopped) and it took the form of a geophysical survey and subsequent test-trenching (more information can be found here). A geophysical survey is a form of ground penetrating radar that allows archaeologists to see features hidden below the topsoil. At Ballybuckley the survey identified a number of geophysical anomalies (potential archaeological features) and these were subsequently investigated by opening test-trenches across them. Test-trenching involves removing topsoil from a long, linear trench, normally with a toothless digger bucket, until undisturbed boulder clay/subsoil is encountered. Removing the topsoil allows the archaeologist to clearly see any archaeological features which may be present in the subsoil, for example ditches, walls, pits or postholes. 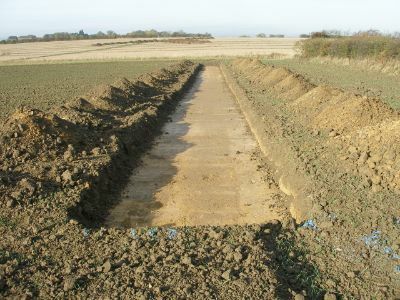 The trenches can vary in length and are typically 2m wide (the width of digger bucket) by 0.30m deep (depending on the depth of topsoil). In Ballybuckley nine trenches were opened over the geophysical anomalies and these revealed an area of medieval activity to the south of Ballybuckley hillfort. This area of medieval archaeology was characterised by a number of ditches and pits, three of which were investigated further by excavating sections through their fills. The first feature sectioned consisted of a northeast-southwest orientated ditch, c. 2.5m wide by 0.40m deep that had evidence for a bank along its northern edge. The ditch was filled by two distinct deposits, which contained several sherds of Leinster Cooking ware. This is a medieval pottery type that generally dates from 12th-14thcenturies AD. A stone lined drain, 0.50m wide by 0.30m deep was cut into the base of this ditch. The second feature investigated was a curvilinear gully that measured 0.95 wide by 0.60m deep. It had nearly vertical sides, a rounded base and was filled by a single fill from which sherds of Leinster Cooking Ware were also recovered. The third medieval feature inspected consisted of a northeast/southwest ditch. It measured c. 1.30m wide by 0.20m deep and was filled by lose stony deposit that contained fifteen sherds of Leinster Cooking Ware pottery. A number of other features were also identified at this location and although they were not investigated further they are indicative of relatively intensive human activity here. Evidence for a medieval farm/haggard? On the 1st and 2nd edition Ordnance Survey maps the approximate area where these medieval features are located is occupied by a small sub-rectangular enclosure, which is situated at the end of long laneway (see map above). It seems likely from the archaeological testing results that this small enclosure dates from the medieval period and that it may represent the remains of settlement site, possibly a farmstead. Interestingly the medieval features are located in an area that was locally known as ‘Leacy’s hollow’, which tradition suggests was the former site of a chapel[i]. This could tie in with an account from 1558 which describes a place called Prishaggard/Prycehagarde[ii] between Ballybuckley and Knockduff (this name no longer survives in the locality). It is likely that this name is a corruption of the Priest’s haggard (farmyard), similar to the townland of Priesthaggard, near Campile in the south of the county. This could indicate that the enclosure depicted on the Ordnance Survey maps represents a medieval haggard that once belonged to a cleric. As there are no recorded ancient church sites in the vicinity of ‘Leacy’s hollow’ it is possible that the tradition of a chapel here reflects the sites former association with a priest (the nearby Church of St. John was built in 1829 on a green-field site donated by the Alcock family). The EIS for Ballybuckley Quarry. Appendix 3. Archaeological Testing, an unpublished report by Tobar Archaeology, July 2006. Excavations.ie: Ballybuckley, Co. Wexford. Archaeological testing, 07E0397. Date accessed 10-6-12.